Hi! My name is Kelsey, and this is my triathlon blog! I love to swim, bike, run, and cook delicious food. These things make me very HAPPY and I want to share it all with you! So this blog is a place for me to talk about all aspects of living a healthy, happy life as an age-group triathlete: training, racing, fitness, nutrition, and motivation. In fact, I have a few rules on happiness, if you're interested in those too! After my first triathlon! That smile says it all. I was hooked! My triathlon career started in the summer of 2013. After a long retirement from my competitive swimming career (7 years out of the pool) and a few years of having my bike function solely as a piece of artwork in my apartment (I was afraid of the clipless pedals! ), I signed up for my first sprint triathlon. I trained on my own all summer and completed the Cornwall Sprint Triathlon on August 25, 2013. I'm sure that I'm not the first triathlete to say it, but that race had me HOOKED! I loved the camaraderie, the atmosphere of the race, the delicious food after, and the fact that I finally had a new outlet for my very competitive side. I joined the Ottawa Triathlon Club in the fall of 2013 and started training with the High Performance Squad, a group of speedy triathletes well-accustomed to standing on top of the podium in races of all distances. My focus has been the sprint distance and over the past three seasons, I have seen huge gains in my fitness and confidence. 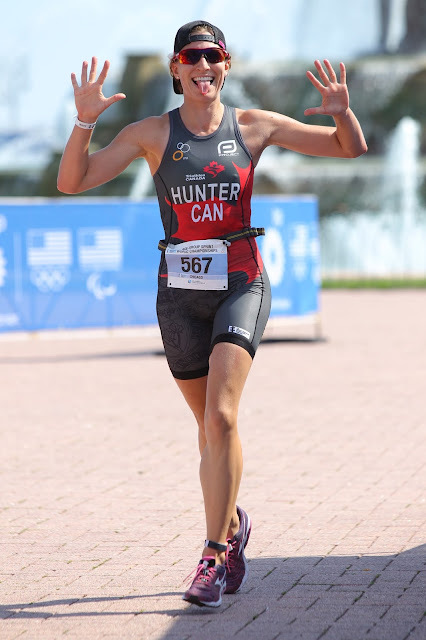 In the summer of 2014, I qualified to represent Canada at the 2015 Age Group Sprint World Championships in Chicago. It was an amazing experience. The 2016 and 2017 seasons saw my foray into long distance triathlon as I completed the Timberman, Victoria, and Maine 70.3s! Whoa, long distance is no joke. I learned that as fun as it is to race 70.3, it just does not fit with my busy career and life as a dog mom. For 3 seasons, I was privileged to represent Coeur Sports as a member of Team Coeur 2015, 2016, and 2017! As I head into the 2018 season, I am excited to re-focus on short distance racing and continue to grow as an athlete. I'm also excited to be "racing naked" so that I can focus on building relationships in the Ottawa community. Finally, I'm most looking forward to continuing to coach the Ottawa Triathlon Club High Performance Squad and taking on additional one-on-one athletes (see my coaching services here)! Swim! Bike! Run! Be happy!